If you really want to stand out online, you need to have imagery that packs a punch. There are loads of content creation resources available online for you to pick from. Some of them are great and others are not. I’ve tried many different online tools and services, for creating visual content to be used on social media, for blogging, and during web design. You don’t need to be a design whiz to having amazing visual content across all online platforms and you don’t need to spend a lot of money or time to create high-quality content either. In fact, you can do it for absolutely free. Here are several resources I can recommend to boost your visual appeal online and help you to catch the eye in a world of digital noise. Flaticon is all about icons. There’s a huge range to be found and it’s fantastically organised. Just search the site and you’ll probably find what you need fairly quickly – I usually do. You can change the colour and set the size before you download the icon and you also get full packs of icons, to keep the icons in your design uninformed. It’s a pretty straightforward website to use. They do display adverts for similar premium services when you perform a search and it’s often hard to tell what an advert is. But, after a couple of visits, you’ll get the layout. Vectezzy is full of amazing vector artwork. Perfect if you’re looking for an eye-catching composition with a slick style. The best part is you can edit the pieces before you download them, to change colours, add text and so on. There is only a certain amount of artwork available for free and much more available on premium. There are various plans – the unlimited downloads package is currently $14 per month. It’s still incredible value at that, considering the minimum time involved and for very high-quality, customised graphics. Pixabay is one of many stock image websites out there, but none offer quite the range of free images that are really high-quality. They host a huge range of image themes and you’ll most often find something more than suitable. You can get photography, video, illustrations and vector art on Pixabay. Again, your search will produce targeted adverts for premium stock websites, so watch out for those deceptive ads. If you don’t have the skill or budget for premium graphic design software, like Photoshop or Illustrator – then Canva is your answer. It has loads of very well designed templates and is organised into categories that make it very quick and easy to design graphics for any platform or typical online space. They’ve thought of everything! It’s a freemium platform. You can use it for free and get by very well. But there are add-ons and certain premium elements that may improve your experience. Canva does have a mobile app version too – making graphic design easy on the go. DaFont has a huge range of free fonts to search for or discover. You can easily navigate through styles and categories and simply click to download as many fonts as you like. There’s a nice feature on the site whereby you can write your text to preview the typeface before you download. Adobe is the premier creative software brand and the standard in the industry for many multimedia production tasks. So, when they launched Adobe Spark as a free, user-friendly online app for creating awesome social media posts, it was very exciting. Spark is designed around storytelling through imagery. They walk you through a simple process to turn images into video, with clever design templates. It’s very handy and a perfect way to start getting videos up on social media without any hassle. 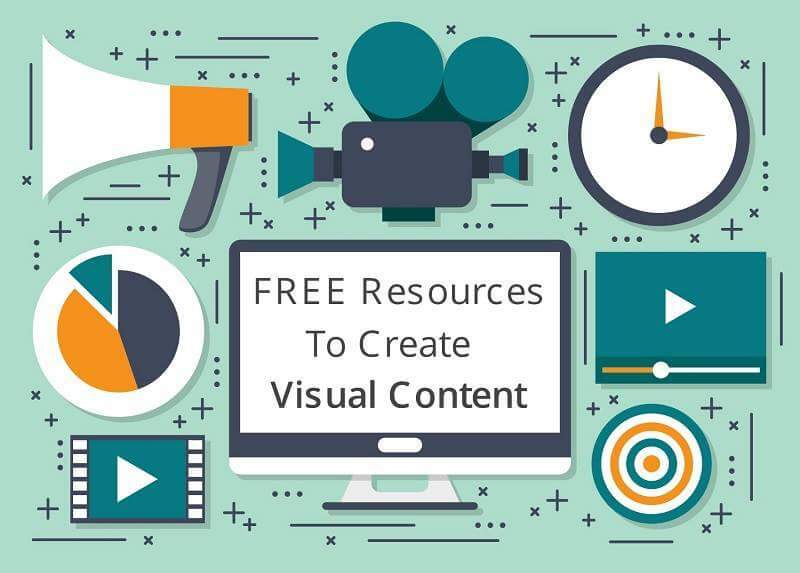 So with all these fantastic resources available online for free, there’s no reason why your content marketing shouldn’t look amazing! There’s no excuse for not having amazing visuals within your content. What are your favourite tools for creating amazing visual content? Let us know in the comments below!